Conventional wisdom says that 'it takes two' to turn a troubled marriage around and that both partners must have a shared commitment to change. So when couples can't agree on how-or whether-to make their marriage better, many give up or settle for a less-than-satisfying marriage (or think the only way out is divorce). 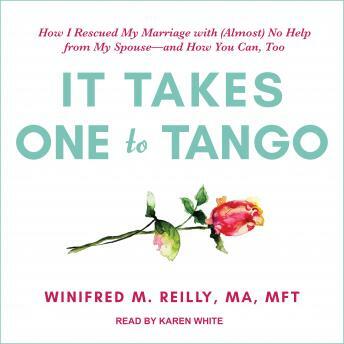 It Takes One to Tango is a groundbreaking guide that shows how one determined partner-acting alone-can spark lasting, significant change in a marriage, often accomplishing change that cannot be made any other way. It doesn't matter how short-fused, argumentative, or seemingly impossible your partner can be-or how long you've been stuck. Marriage and family therapist Winifred Reilly has this message for struggling partners: Take the lead. Doing so is effective-and powerful.